The Erawan Shrine is one of my favorite places in Bangkok. It's a Hindu shrine dedicated to the Hindu creation God Brahma. 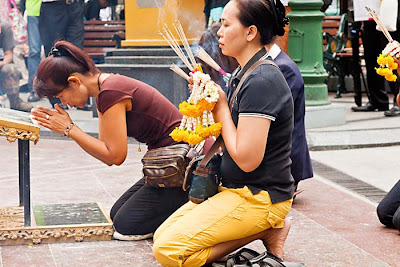 Thai Buddhism blends Hindu deities with Buddhist theology. The shrine was built in 1956 to appease Gods who were displeased with construction of a large hotel on the site (the Erawan, now Grand Hyatt Erawan). The project was plagued by cost overruns and injured workers. Once the shrine was completed the project was finished without further mishap. The Erawan Shrine is one of the most sacred sites in Thailand. All day long Thais come and go, praying and making offerings hoping to improve their lot in life or make merit and improve their karma. Tourists frequently find their way to the shrine, but surprisingly it's not mobbed like many of the temples in the old part of Bangkok. The horrible traffic and congested roads in the area probably keep the busses away. It’s quiet and peaceful; chaotic and deafening all at the same time. It’s whatever you make of it. The shrine's importance in Thai life was made terribly clear in 2006 when a mentally deranged man destroyed the statue with a hammer. The crowd at the shrine beat him to death, in broad daylight, before authorities could intervene. These pictures were made during an afternoon at the shrine the first week I got to Bangkok. There are more photos of the Erawan Shrine in my PhotoShelter archive or available from ZUMA Press.